"His patriotic statements about 'the best school in the world' have fallen sweetly on the ears of the veterans"
29 NOV 14 Nikolai Tsiskaridze, as expected, has been formally confirmed as Rector of the Vaganova Academy in unopposed election today, winning 227-17 in the poll of 244 possible votes, which include professors, students and even school canteen workers. 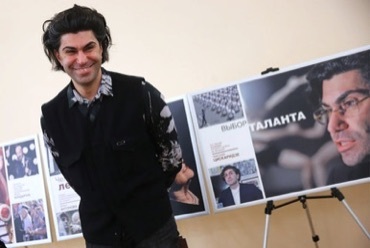 This report by dance critic Anna Gordeeva in the online daily gazeta.ru notes that during his year as “acting” Rector Tsiskaridze, 40, made some interesting repertoire choices for the graduates - Bournonville and Balanchine - while also delivering the patriotic statements that go down so well at the moment. None of the half-dozen reports I have seen today mentions the Bolshoi acid attack scandal that led to the theatre firing Tsiskaridze last year, though this one refers to his criticism of the theatre’s reconstruction. Nikolai Tsiskaridze, appointed a year ago as acting Rector of the Vaganova Academy of Russian Ballet, on the order of the Culture Minister, has stopped being “acting” and is now the full Rector of the institution. On the morning of November 29 secret elections were held at the Academy: 227 people voted in favour of Tsiskaridze, with 17 against. This means that the former principal of the Bolshoi Ballet - an organisation which the Petersburg ballet world has always treated with mistrust - has won the support of the staff. The entire establishment voted in the elections, as laid down in the academy’s charter. The delegates to the election conference represent legendary professors and star-makers (such as Ludmila Kovaleva and Marina Vasilieva), the majority of ordinary teachers, and the “proletariat”, including plumbers, wardrobe and canteen workers. Also senior students. To be approved for the position, a candidate had to receive 50 percent plus one vote. A year ago, the appointment of Tsiskaridze caused a scandal. Three separate camps protested loudly: the Petersburg patriots (“A Muscovite in this position? It’s a nightmare!”), the dancer’s enemies in the Bolshoi, who were offended by his emotional criticism of the costly reconstruction of the Bolshoi theatre, and two Petersburgers who also coveted the job. Alexei Fomkin, the academy’s Pro-Rector and former mime artist in the Mariinsky Theatre, called a press conference and spoke about an impending misfortune for the Petersburg ballet. Meanwhile the Mariinsky soloist Ilya Kuznetsov raged in social media. Teachers who knew the actual state of affairs in the academy had no objection to a change of Rector but they did not like offending the school’s artistic director, when it was another person and another position. It then seemed that Fomkin and Kuznetsov would be rivals with Tsiskaridze in the elections for Rector. However on 30 October this year, when the candidates had to present their applications, neither of them did so. Only one person filed an application - Tsiskaridze. Last autumn Fomkin left the Academy and went to Moscow to become deputy director of the Moskvich cultural centre. Kuznetsov has just ended his performing career in the Mariinsky, and plunged into his business affairs - he owns a chain of private ballet schools. Tsiskaridze himself, during this past year, has done all he can to make the academy’s staff see that he is the man for them. He delved into everything and exploited his reputation, for example, to raise funds for new floorings in the school - it is important for a teaching institution that young people are now running around in breaks but sitting on the grouns, stretching. He also negotiated various collaborations with other well-known schools and theatres. His patriotic statements about “the best school in the world” have fallen sweetly on the ears of the veterans. The graduate performances offered repertoire of complex foreign work: for the final year, Auguste Bournonville’s legendary Le Conservatoire, for the next, George Balanchine’s Raymonda Variations. From the inside view, the academy’s core staff were happy to see that no one was dismissed. From outside, it’s considered that this new repertoire is broadening the range of opportunities for graduates, and by extension in future the range for theatres. But why was there a need to change the leadership last year? From the official point of view it is simple: former Rector Vera Dorofeyeva reached the upper age limit for the job and had to retire. Unofficially, however, the preparation of graduates was raising questions. Valery Gergiev spoke more than once about the school’s unsatisfactory work, in the very theatre to which graduates were taking up employment. By last year, the management structure of the academy was fairly odd: the Rector - who is the person who signs everything off - was a business manager, Vera Dorofeyeva, a sociologist by training who had never danced. The number two post of artistic director was occupied by the former Mariinsky ballerina Altynai Asylmuratova. Vladimir Medinsky, in signing the formal announcement of Tsiskaridze’s appointment, shifted the structure to the principle that the person answerable for the preparation of artists would be a man who knows what stage performance is. In taking on the new Rector, the academy lost its artistic director. Last year Tsiskaridze asked the Mariinsky ballerina Zhanna Ayupova to do that work - she is one of the best dancers of her generation, who not long ago ended her own performing career and had already begun distinguishing herself as a coach. The tandem appears to be working very successfully. The contract Tsiskaridze has won in these elections will run for five years.